There are three series of maps that cover the entire country: SHOCart, Kartografie and KČT. Each has its pros and cons, but they are all reasonably detailed, accurate and usable. All three, of course, show the official numbered cycle routes and indicate the surface quality of each section. In addition, they all have English legends and show tourist information (restaurants, hotels, campsites, etc. ), suggested routes (including elevation profiles) and distances in km between points. And they all come in a plastic sleeve to keep the rain off. My favourite cycling maps are published by SHOCart. These are the maps I’ll be using for my cycle ride around the Czech border over the next couple of years. SHOCart publishes a series of 170 cycling maps at 1:60,000 scale. They typically cost 99 Czech crowns (CZK) each. They look good, have a high quality feel and fold up smaller than the other series described below. The map legend is in Czech, English, German and Polish. The company also issues a spiral-bound cycling atlas of the entire country as well as an excellent loose-leaf A4 ring-binder edition. Most usefully of all, an interactive version is available in English on-line free of charge. The second series (160 maps, 1:70,000 scale, around CZK 85 each, legend in Czech, English and German) is published by Kartografie. Like the SHOCart ones, these maps are updated fairly regularly and are accurate enough. They traditionally come with an orange cover, but more recent additions to the range are blue. The third series is produced by KČT – the Czech Tourists’ Club (28 maps, 1:100,000, CZK 109, legend in Czech, English, German and Polish). I’m not so keen on the KČT maps. They have a smaller scale than the other two series and I find them less easy to read. In my experience they are also updated less frequently. This is quite a big issue, as the Czech cycle route network is expanding apace and alters significantly from year to year. 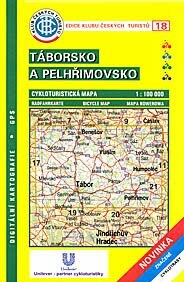 On the other hand, each map comes with a booklet containing a large number of suggested routes and other information (in Czech only). The three series described above are the only ones covering the whole of the country. Selected tourist areas are covered by maps produced by Žaket (1:65,000, CZK 65, allegedly printed on waterproof paper) and Wander (1:75,000, CZK 59), but I have no experience of using either. There are also various guidebooks available for specific routes or areas (published, for example, by Freytag & Berndt and Esterbauer), but I’m not aware of any in English. Walking maps can also be useful, especially for mountain bikers. KČT, SHOCart, Kartografie and Kompass all issue 1:50,000-scale maps showing cycle trails. Where can you get hold of these maps? If you are in the Czech Republic you’ll find them in most bookshops and in many bike shops, petrol stations and large supermarkets. You can also buy the SHOCart and KČT maps on-line from Freytag & Berndt.